Nisyros seen from a beach on nearby Giali. Last month, I rediscovered Nisyros and it was wonderful. It is odd that I would write I “rediscovered” the place, as there are few islands I have set foot upon more often in my near-decade with Peter Sommer Travels, or in my life, for that matter. I must have been on Nisyros well over thirty times as a tour expert on Peter Sommer Travels’ cruises, including three visits in May and June of this year. Nisyros in the Dodecanese archipelago is, to be clear, not one of the most famous names among the Greek islands. It is not established as a must-see experience like Santorini or Mykonos, nor is it a hugely popular holiday destination like Corfu/Kerkyra, Rhodes or Kos. Nonetheless, it is one of the islands we stop at most frequently on Peter Sommer Travels’ cruises in the Aegean, which is why I have been there so many times. Why is that? There are two reasons: the location of Nisyros, just to the south of Kos, makes it a superbly convenient stopping point on many of our itineraries, including the two-week Cruising to the Cyclades, the two-week Cruising the Dodecanese and the one-week Cruising the Aegean: from Kos to Patmos. 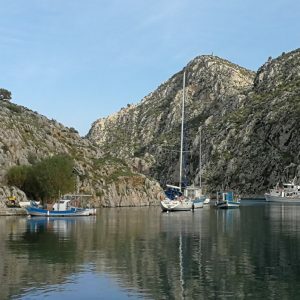 In other words, Nisyros and its small port at Mandraki are a practical necessity for many of our gulet cruises. A typical lane in Mandraki, the labyrinthine only town on Nisyros. Every bit as importantly, however, we are fond of Nisyros. The island is fascinating and beautiful; there is a lot we can show our guests there and a lot of stories we can tell, from ancient sites via volcanic wonders to traditional island life; the inhabitants are superbly friendly and their food is delicious. Although we usually only get to spend an afternoon and evening on the island, our guests tend to be very impressed with the island and its atmosphere. So, how can I claim to have “rediscovered Nisyros”? Let me try to explain. My original “discovery” of Nisyros took place in the spring of 2009, when I first visited the island. I was travelling with my esteemed colleague and Peter Sommer Travels stalwart, Michael Metcalfe, on a first reconnoitre for what was then our future programme of cruises in Greece. We only had parts of two days to familiarise ourselves with the place and its main sights then, but it was compelling. We identified the steam crater of Stefanos as one of the most unusual sights on our itineraries, the ancient fortification at Paliokastro as one of the best-preserved examples of Greek defensive architecture in the islands (I promise I’ll write about it soon), and the town of Mandraki as a laid-back and unspoilt traditional settlement of great charm and in a stunning location. Ever since, Nisyros has been a regular feature on our Greek cruises. The caldera of Nisyros and the steam-crater of Stefanos, as seen from the walk down the caldera’s slope. That was a beginning. Since then, I (and many of my colleagues) have been to Nisyros with our gulets and guests for all those dozens of times mentioned above. Over the years, we have met many of the islanders and made friends with them, found different stories to tell about the place as a whole and the places within it, explored new angles of Nisyros. We have discovered one of our all-time favourite restaurants high on the island’s caldera rim and we have brought many of our guests to the tiny but superb archaeological museum, not yet open during that first visit in 2009. It is said that familiarity breeds contempt, but as any traveller will attest, it is not always so. Familiarity can grow understanding, curiosity, appreciation and affection! 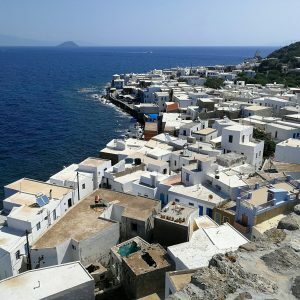 The more I visited Nisyros, the greater grew my longing to spend a little or a lot more time there, to explore more of the island and to get to know it even better. A panoramic view across the village of Emboreio and the volcanic caldera of Nisyros. And that’s what has finally happened. 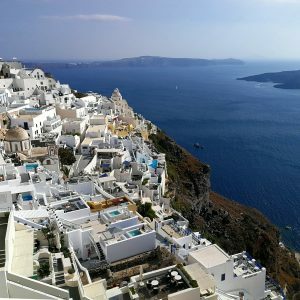 In March, Peter, Michael, Nota, Maria, Tasos and I spent a busy week reconnoitring the Dodecanese for our brand-new Walking and Cruising the Dodecanese itinerary. As reported here, we found many wonderful walks, views and new sights to behold, the stuff of a walking cruise, but for various reasons we could not make it to Nisyros at the time. Thus, after finishing a charter in July, I went back to Nisyros for just over two days, endeavouring to explore its walking potential. A view from Nisyros towards Giali and Kos. What a wonderful opportunity! At nights, I stayed in a lovely rental apartment, operated by friends of friends and surrounded by trees and flowers (and kittens), a short walk to a seafront with traditional tavernas and cafés to provide sustenance and company. At daytime, I set out with my trusty rental car on the island’s very few roads to find walks across the interior. On foot, I managed to follow just over 30 km’s (or under 20 miles’) worth of tracks throughout the island. It was a very peaceful and quiet experience, far from the busy resorts of Kos and the herds of day-trippers that are ferried from there to spend a few hours on Nisyros each day. Instead, I met herds of goats and sheep, also one of cattle in the caldera, and the occasional local tending to his or her stock (I was surprised to find most of them knew me to see and stopped me for a chat – the locals that is, not their stock). Once or twice, I was inspected by eagles circling high above me. It was exactly what I had been hoping for – and also exactly what we needed to complete that walking itinerary. The 4th or 3rd century BC fortification at Paliokastro is built entirely of basaltic lava, locally quarried. Nisyros is a small island, essentially a truncated and eroded volcanic cone sticking out of the Aegean sea. Its horizontal shape is close to that of a circle, measuring only about 8km (5 miles) at its longest diameter. It is remarkable how much there is to discover within that restricted circumference, which far exceeds the area of that hypothetical circle, because none of its surfaces are flat. Within the circle of its coastline, most of Nisyros is made up of variously steep slopes. On walking Nisyros, two aspects of the island become especially striking to the visitor. The first is how the island is entirely and totally dominated and determined by its volcanic origins. 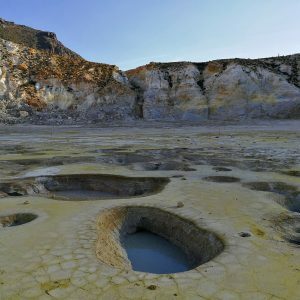 From the island’s outline to its topography, from natural landforms via traditional building materials to the composition of beach sand, from colours to scents, the volcanic history of Nisyros is omnipresent. At every step and every viewpoint, it comes to mind, be it in the form of the smooth “bubbles” in the cliff of an old magma-flow, of the jagged cubes of broken lava, of the looming presence of multiple long-dormant craters, or of the vast amounts of pumice, volcanic ashes that have fallen on the island and on its neighbours, tiny Giali and much larger Kos, during so many eruptions. A kalderimi, or traditional paved mule-path, on Nisyros. Note the extensive agricultural terracing in the background. The second aspect is how the island’s remarkable agricultural fertility, derived from its geology, has led to an intense human footprint all over Nisyros. There are thousands of kilometres of terrace walls, countless scattered farmsteads and hamlets (now mostly abandoned), each of them surrounded by a local labyrinth of field walls and ancillary structures, there is also a plethora of little chapels (many now ruined) even on the remotest mountain tops, and – importantly for walkers – the island is criss-crossed by a dense network of kalderimia, the traditional stone-paved mule-paths that used to link the settlements on more direct and thus steeper routes than those required by modern transport. With the exception of the most forbidding jumbles of lava blocks, human traces are found across all terrain on Nisyros, from the shore up to its highest summit, just under 700m (2,300ft) above sea level. Rather rugged: an eroded lava flow near Emboreio. So, in many ways a walking tour of Nisyros is an essential lesson about the Greek Islands, how each of them is defined by its geology and geomorphology, and how their inhabitants have been using them for millennia, eking out a living from the restricted resources available and creating a unique expression of human effort and of local character in each place, always conscious of the next islands or the nearest bit of mainland on the horizon. Like most Greek Islands, Nisyros has been served by its geography and topography to shape its inhabitants, making it clear to them where they were, and where they weren’t, what they had and what they hadn’t, what they offered and what they sought. As regards my longing to spend time on Nisyros, it is unquenched. I miss it now and I look forward to my next two visits, in September and October, and hope to return for longer some other time. You can discover or rediscover Nisyros on all our Greek cruise itineraries: Cruising to the Cyclades, Cruising the Dodecanese, Cruising the Aegean: from Kos to Patmos, and especially on our new Walking Cruising the Dodecanese! And if you want a more extensive and intensive experience of the place, we can tailor-make you an itinerary that permits deeper exploration of the island, along with its immediate neighbours, Kos and Tilos. Wonderfully written – makes me want to go there!